Yesterday morning, before I explored downtown Allyn, Vicki and I spend some time looking at an atlas and logging onto websites for campgrounds—basically, trying to plan the rest of this trip. We tried to move up my reservation outside of Yosemite and make a few other reservations at campsites between Bremerton and Yosemite. Even though Vicki is a good planner, we got nowhere. It is impossible to do this kind of thing on the phone. I decided to wing it. This morning, I left Bremerton about 7:00 am. I was going to spend a little time in Portland. But, by the time I hit the border of Oregon, the traffic was heavy, and I was feeling . . . well, fenced in. Since I drew close to Seattle a few days ago, I had been feeling a little anxious. There was more traffic, houses were close together, trees lined the Interstate. Those broad vistas, the 360 degree horizon, the big sky—all that was gone. When you lose that space, it affects you. So, I passed by Portland. I was vaguely heading toward the Redwoods; then, as I was looking at my atlas at a rest stop, I noticed I was three or four hours from Crater Lake National Park. There were, according to the atlas, many campgrounds on the way. I thought I would find a campground, maybe as soon as I turned east on Hwy 58, then visit Crater Lake tomorrow. Every time I came to a campground, I thought, “I’m going to go a little further, get a little closer to the park.” Then, I decided that I would go to the park today and find a campsite on the way out. 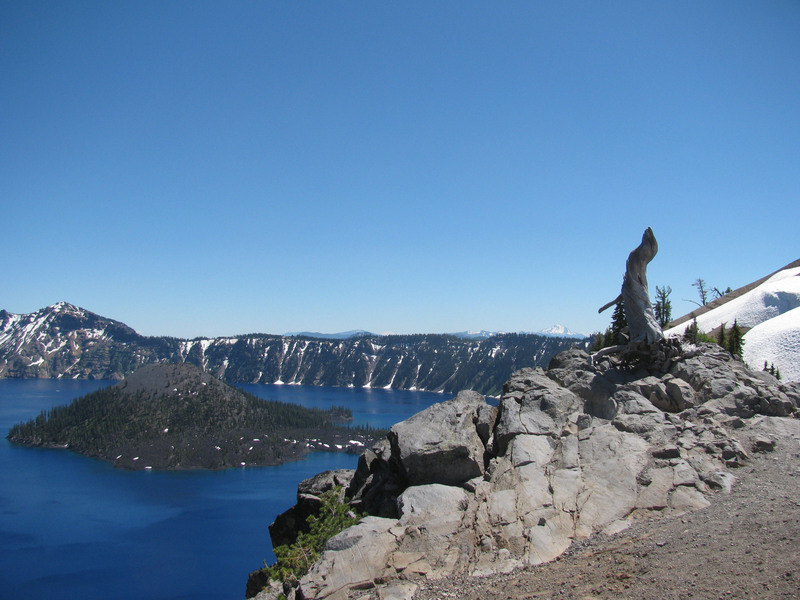 Crater Lake National Park is more uniform and much smaller than Yellowstone. It sits on a plateau at about 6,000 to 8,000 feet. It is covered with huge Ponderosa pines, but it has few other forms of vegetation. The earth is mostly sand and rock. The lake itself was formed by a volcano. A road circles the rim of the dormant volcano. On this road, tourists can stop and look down at the lake, which is the bluest blue I have ever seen. Even though most national parks are booked well in advance, sometimes six months ahead, I decided to try to get a campsite. I lucked out. I was able to get a site at Mazama Village, elevation 6,000 feet. Before I left on this trip, my friend Michael said over and over, “I don’t know how you’re going to camp in this heat.” Well, don’t worry. I have air conditioning. There are still pills of snow all around my tent. About a week ago, the entire campground was under snow. This in the middle of July. « Whose plan was this anyway? I am living vicariously through you and your travels. Thank you for sharing your pictures. Crater Lake is beautiful. Actually, beautiful doesn’t even begin to describe it. I’ll try to have fun for both of us. Thank you. I know it will be a sacrifice and take a lot of energy to have fun for two but I appreciate your effort. btw-My kids hate the fact that I go out of my way to find a “mom and pops” place to eat instead of going in a “McKingsTacoWay” drive-thru.